It’s pushing the century mark, and you need a cold, refreshing adult beverage, but you don’t want just another gin and tonic? This thirst-quenching cocktail goes down so easily, you’ll have to watch yourself! 😆 It’s a variant on the classic Peruvian Chilcano de Pisco… the passionfruit pulp replaces the lemon or lime juice in the classic cocktail. I think you’ll find it’s quick and easy to make as well. I still find myself looking back at our month in Peru with longing. It may be awhile before I “move on,” so thanks for indulging me for a time. Cuzco introduced me to chilcanos. Prior to Cuzco, I’d never even heard the word. Pisco sours, yes, chilcanos, no. Literally our first stop upon arriving in Cuzco (after dropping our bags at Hostel Corihuasi) was a hike down the steep cobblestone street to the Museo del Pisco. Translate from Spanish to English –> Pisco Museum. IN the beginning, God created the heavens and the earth. But after such hard work, he was thirsty. And thus could think of nothing better than to create the grape and, from its fruit, make a fine spirit. He called it PISCO. And he saw that it was good. And it became the elixir of other gods. Later, he continued to entertain himself creating the animals, plants and the rest of the world. 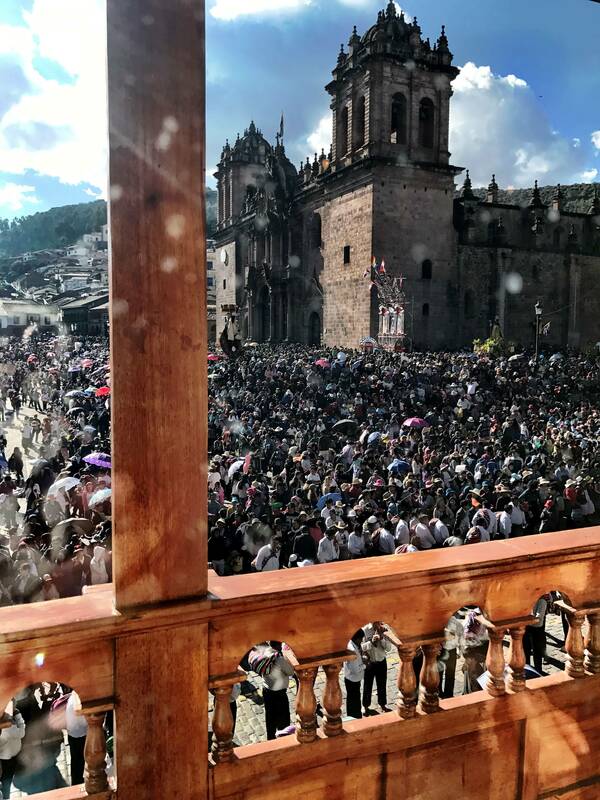 When it is proclaimed in Peru that God is Peruvian, it’s no joke; actually, it is a popular saying which people take very seriously. And when it is claimed that pisco is Peruvian, it’s viewed as an undeniable and irrefutable fact, based upon historical evidence. Today, Pisco is Peru’s flagship drink and a spirit that continues to gain more international fans every day. 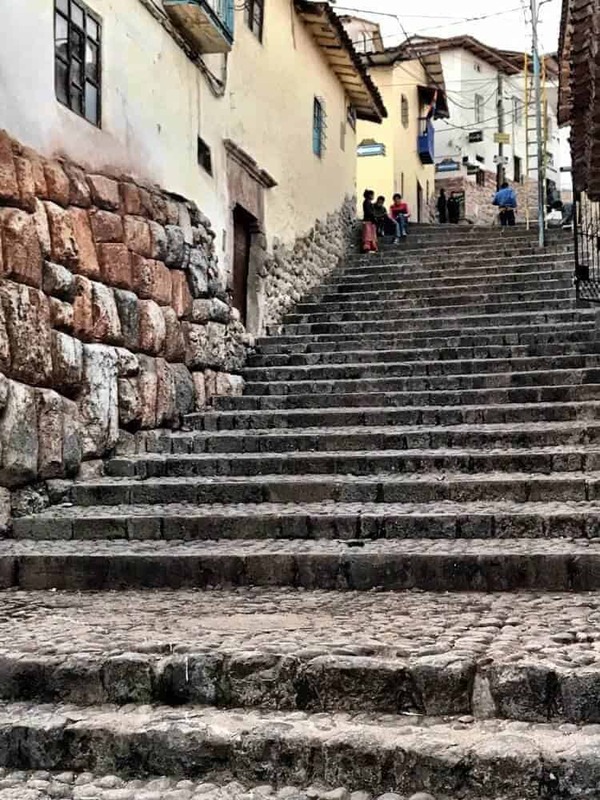 A small section of cobblestone steps in Cuzco we climbed at least a couple of times each day… In addition to being a city literally in the clouds, it’s steep too! We walked an average of 5 miles per day while Cuzco! The building in the foreground was one of our favorite stops… Qosqo (Quechua spelling for Cuzco), a craft beer pub with amazing trout ceviche! 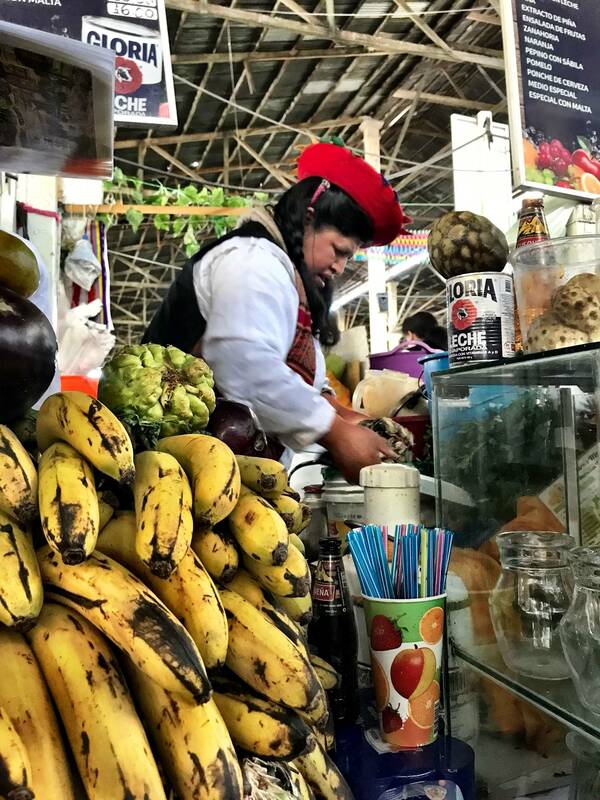 One of the prime attractions at the San Pedro Market was the fresh juices and smoothies… I had a maracuya (of course! ), pineapple, and banana smoothie. This lovely woman broke down the fruit while we waited. You can’t get much fresher! A typical street scene… colorful textiles, clothing, jewelry, street food (beware! ), babies on their mommas’ backs. It was always lively! Pisco is a colorless or light yellow to amber colored brandy (a liquor distilled from wine or fermented fruit juice). It is made from grapes grown in Peru. Chileans may lay claim to pisco, but do not listen! 😆 While cognac – also a brandy – needs to be aged in oak barrels, pisco must not be. One of the key regulations governing Peruvian pisco is that it cannot be aged in wood at all. Pisco must be made in one of five coastal valley regions of Peru, including Ica, Lima, Arequipa, Moquegua and Tacna. It may be made up of a combination of 8 unique grape varietals, each lending its own characteristics to the end product. For more on pisco, see The Complete Guide to Pisco. So, back to Cuzco and my Chilcano de Maracuya. 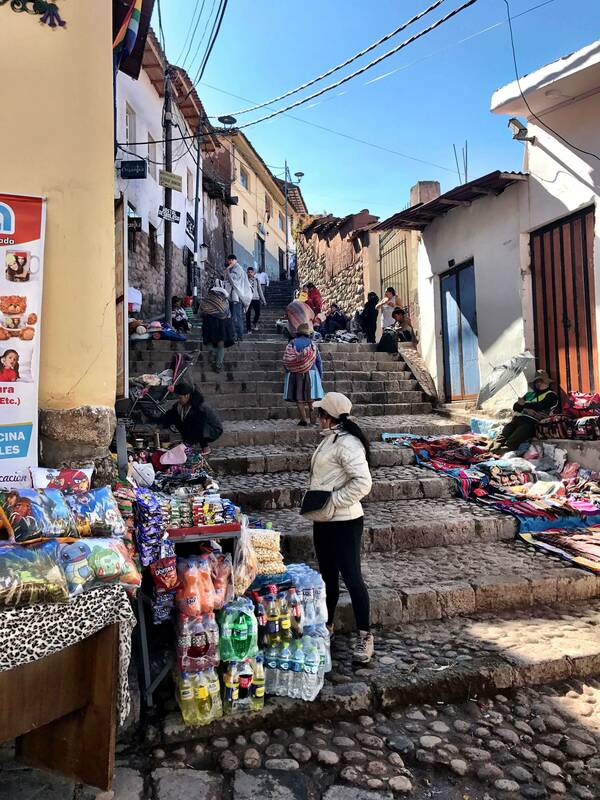 We spent a total of 9 nights in Cuzco – 5 prior to the Ausangate trek and 4 following. Cuzco is an ideal place to acclimatize for high altitude treks as its elevation is around 11,000 feet (3,400 meters). 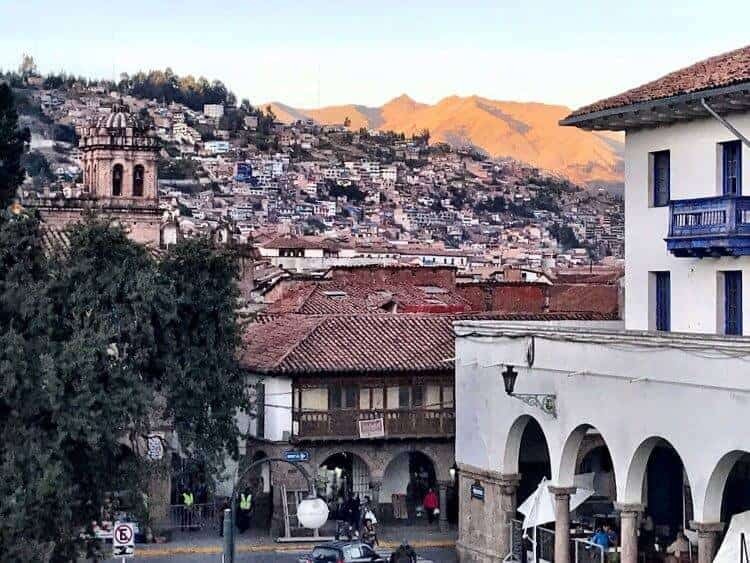 I often referred to this beautiful city as “at once raw and breathtaking.” It’s a third-world country with dirty cobblestone streets and children begging juxtaposed with beautiful Spanish cathedrals, ancient Inca ruins (Sacsayhuaman), and gorgeous plazas like the Plaza de Armas and the Plaza de las Nazarenes. It is a city that never sleeps; its people love to party (and drink cocktails)! The Pisco Sour is Peru’s best-known cocktail. I particularly enjoyed a variant on the Pisco Sour – the Coca Sour. Yes, the pisco is infused with coca leaves. Yes, coca is completely legal in Peru. We’ll save the topic of coca for another day. 😉 However, I had some issues with nausea (probably due to altitude and food choices), and the Chilcanos section on the drink menus suddenly seemed more appealing than the heavier pisco sours made with frothy egg whites. Chilcanos, as mentioned at the beginning, are made with ginger ale (my favorite mixer). I’ve been a fan of maracuya since our Peruvian friend Sirena introduced us to maracuya pie. You may remember a trio of Tropical Margaritas, my favorite being the maracuya? So, this simple and straightforward drink comes together like this: Fill a highball glass with ice. 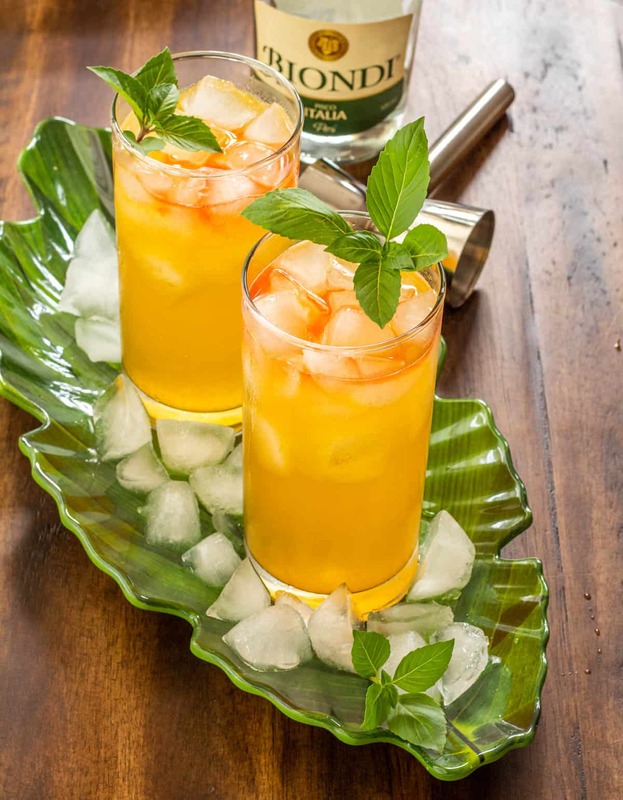 Add 3 ounces of good pisco, 2 ounces maracuya pulp (without seeds), and top with good ginger ale. Lastly, sprinkle a few drops of angostura bitters, and garnish with mint or basil. As I said, it’s so refreshing, you’ll need to watch how fast it goes down! I actually couldn’t get fresh passionfruit at my market when I went to work on this cocktail. I was thrilled to find Goya Foods has frozen maracuya pulp with NOTHING ADDED! I prefer cocktails that are NOT sweet, and I certainly didn’t want any high fructose corn syrup in this one. It worked great! I would prefer to use the fresh pulp with seeds removed, but the frozen was a fine substitute. I hope you’ll give this one a try! 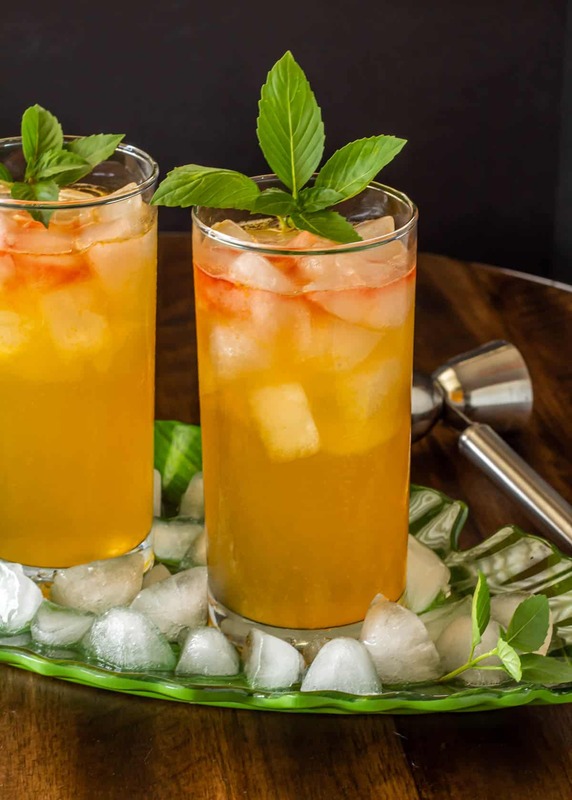 Cool, light, and refreshing... Chilcano de Maracuya features Peru's beloved pisco, fragrant maracuya (aka passionfruit or passion fruit), ginger ale, and a few drops of bitters. This one is perfect on a hot summer's day! Fill highball glass with crushed ice. Add pisco, maracuya, and ginger ale. Stir well. Add a few drops of bitters, and garnish with mint or basil leaves. Pisco Portón is a brand widely available in the U.S. market. We enjoyed the Biondi that we picked up in Cuzco. You can use either ginger ale or ginger beer. Hansen's all natural soda has a really nice flavor. 3 ounces is a good amount of pisco, and the drink doesn't taste strong. Proceed carefully! What a gorgeous cocktail! It is SO hot here - I wish I was sipping on this! I really enjoyed all the photos and yes please to that cocktail! That sounds so refreshing!!! I've been loving cocktails this summer. Yummy, that looks beautiful and delicious! I've never heard of pisco but I want to find some and make this drink real soon! It was fun to look at all of your photos! What fun you must have had. Thank you Elaine! Pisco is becoming more available in the US for sure... I'm not sure about other countries. It is versatile in a cocktail, and I think you'd really enjoy this one! My pleasure Jagruti :-) This is a thirst quenching cocktail, and goes down perhaps a little too easily!